A map, with businesses on. Yell.com has produced an 'interactive' UK map with the nation's local businesses listed on it. The online presence of the company behind the Yellow Pages (apparently they do a book with phone numbers in it or something) has got with the Teenies/Tenties/Tensies and put its local company data online for all to see. Now the cynical among you may point out that Google Maps and Bing maps have been doing something similar for years, but Yell does apparently have an extensive database of 2 million businesses. To find out just how extensive, and if it's actually any better for you, you will have to check it out at Yell.com/maps, where you can see the 'magic'. 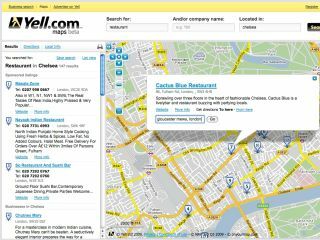 Matthew Bottomley, director of new media product marketing at Yell, said: "Yell.com Maps is the local businesses directory magically brought to life on a map. "Yell enables people to find local businesses in whatever way suits them, whether that's using the trusty Yellow Pages in their armchair at home, over the internet at work, or on their mobile when they're out and about. "They can now also decide how they want to see the businesses presented to them - whether that's simply a list of relevant businesses to choose from,or whether it's seeing, on a map, where that business is physically located."